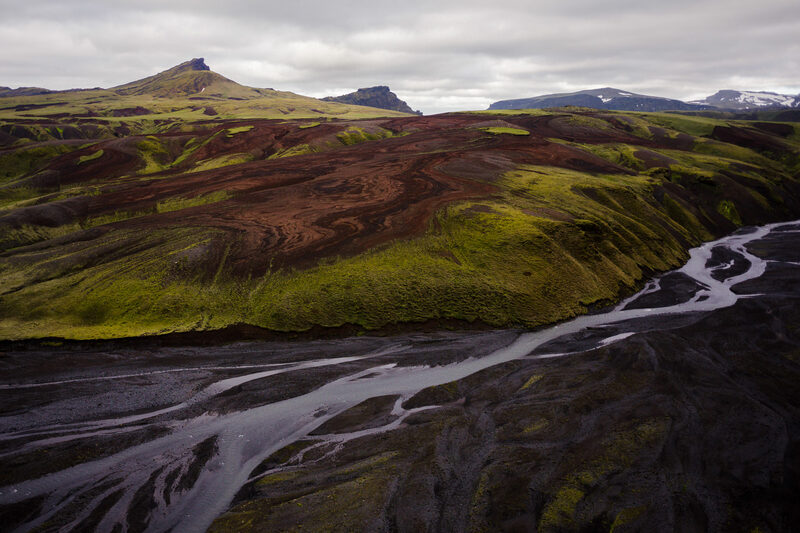 A few weeks before visiting Iceland, I made a last-minute, semi-impulsive decision that changed the dynamic of my entire trip — I bought a drone for landscape photography. My reasoning was simple: I had one, specific photograph in mind, but I could only take it from above. In Iceland, there is a beach (at Jökulsárlón) where icebergs wash onto shore. I had the idea to photograph this famous beach from the sky — an image of breaking waves on black sand, shot straight down, with ice floating in the water. Jökulsárlón is one of the most-photographed landscapes in the world, but I had never seen a photo like the one I envisioned. The idea for this single image led me through one of the craziest three-week stretches of my life. I learned soldering, I read about radio frequencies, and I discovered that it is possible to survive with just fourteen hours of sleep across four days, then stay awake for twenty-four hours straight. A GoPro camera seems to work well for action sports, but its tiny sensor and fisheye lens render it simply unusable for the large prints of landscape photography. Even when modified to have a non-distorted view, GoPro images are nothing close to those from a crop-sensor or full-frame camera in quality. The issue is that, with few exceptions, drones are only made to carry GoPro cameras — and even then, almost entirely for video. Nowhere could I find a dedicated drone to carry a mirrorless camera or DSLR, aside from $10,000 models which were far too large to carry overseas. Further, even the best built-in drone cameras have point-and-shoot sized sensors. So, in a moment of brilliance/stupidity, I decided to build a custom drone. Drone photography is a growing market — one of the fastest — and I hope to see dozens of products within the next decade which fit my needs. At the moment, though, we are early in an era; no company yet has an inexpensive, simple-to-use drone for mirrorless cameras. If you want the highest-quality still images possible, you have to get creative. Of course, a few photographers have been using drones for years — decades, even — so I know that this is old news for some. But there is no denying that the drone market is larger than ever, now starting to become mainstream. I knew that it was time to get one of these crazy machines for my own photography — to learn about drone photography, and to add another creative tool to my arsenal. Before the X8+ drone can fly, it needs to find itself — spiritually, emotionally, and geographically. Sometimes, the drone’s GPS took half an hour to locate suitable satellites; other days, it would refuse to start searching in the first place. And if the drone can’t recognize its position, it doesn’t start the motors. The GPS problems were nothing, though, compared to the freefalling-over-a-river problems. Three times, actually, my drone lost control over a large body of water; twice, it flipped completely and began to fall to its death. Looking back on all the drone’s mishaps in Iceland, I truly am shocked to say that I brought it back home in (generally) working condition. In fact, it is hardly an exaggeration to say that this drone has a stronger sense of self-preservation than I do. Once, it flipped at launch and got sand in six of its eight motors, which would no longer spin; another time, one of the motors died in midair without an apparent cause. In both instances, the drone shook off the injuries and lived to fly another day. 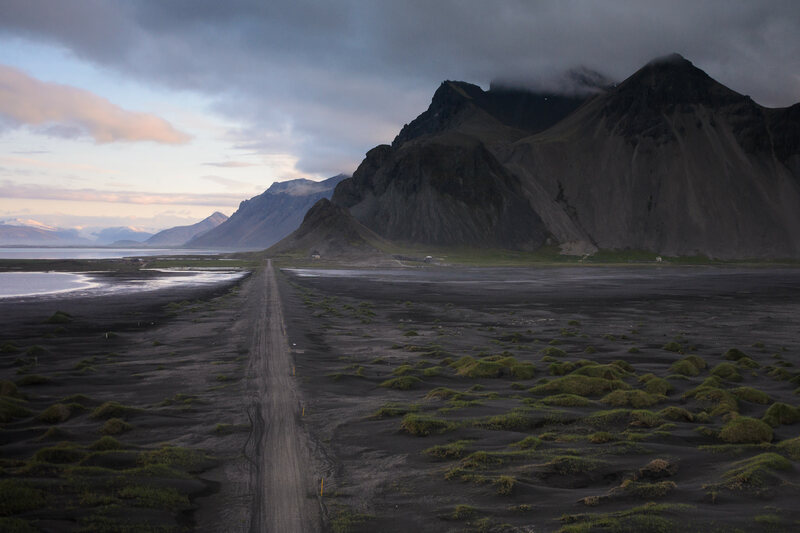 The drone spent hours in the backseat of a car, speeding through the bumpy roads of Iceland’s interior. It lost three separate screws during a crash-land, as well as a chunk of propellor. It flew in humidity thick enough to kill my camera’s live-view transmitter, and wind strong enough to shake a car. Iceland is a rough land, and I am both impressed and surprised that my drone survived. I am to blame for most of these terrifying experiences, of course, since I chose to fly the drone in such crazy conditions. Some issues, though — like the up/down control deciding not to work, as the drone began a freefall — were out of my control. As I said, this is a new territory for photography; drones are getting better every year, but they certainly aren’t perfect yet. Still, despite these harrowing experiences (there is no “safe, two-minute flight” for a drone), I can say with conviction that it was absolutely worth the effort. Drones offer an entirely new perspective on landscape photography. 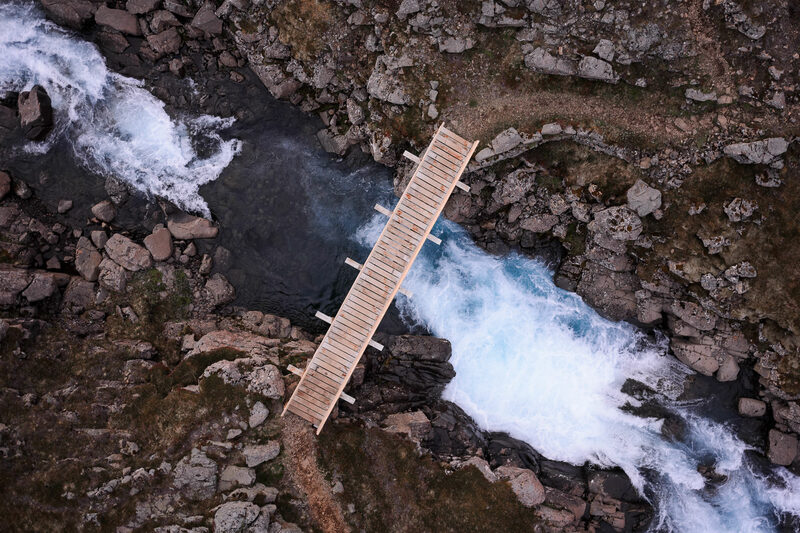 When viewed from above, everyday locations become amazing and surreal. And, in a place like Iceland, a drone is nothing short of amazing. I certainly did not expect the attention that my drone would attract, either — that is, I did not expect the positive attention. Judging by recent headlines, I figured that my drone would be a nuisance to onlookers, and I thought I would need to fly it far from others whenever possible. The reality could not be more different. 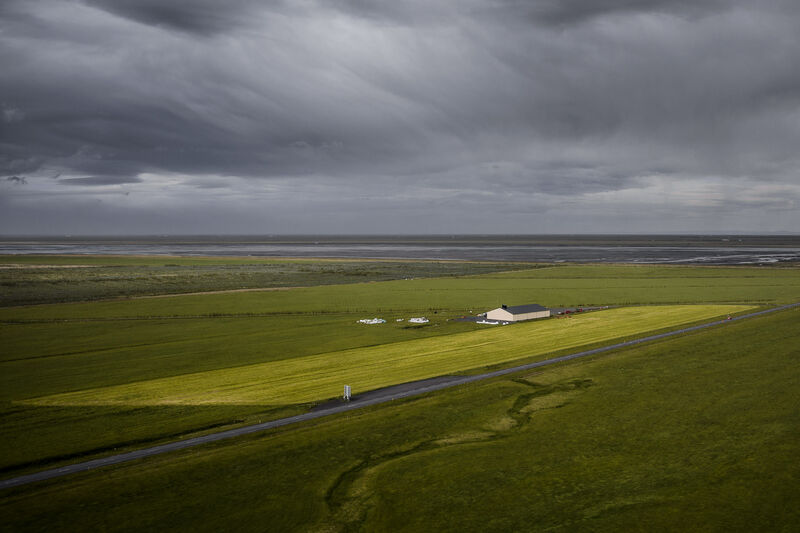 Rather than photographing Iceland’s beautiful landscapes, nearby tourists would take photos of the drone in mid-flight. And whenever I set the drone on the ground for takeoff, a silent group of spectators would gather nearby. A crowd gathered at Fjaðrárgljúfur canyon in Iceland — the drone is on the ground, out of frame. Ultimately, the best part about a drone is that it offers an entirely new creative perspective for photographers. We are in a narrowing window of time when drones are still something of a novelty, and legislators don’t yet seem to know how to regulate their operation. Yes, it was an impulsive decision to jump on the drone bandwagon this early — but I would take the same path again in a heartbeat. And the photo of the iceberg beach? It stands as perhaps my favorite image in my portfolio, almost exactly how I had envisioned it before traveling to Iceland. That’s the best part about drone photography — despite the harrowing freefalls and frustrating GPS issues, this new photographic tool occasionally does work exactly as planned. In the near future, I will be publishing more drone photographs on Photography Life — in the mean time, feel free to visit the drone gallery on my website if you would like to see a few more images. Without a doubt, landscape images with a drone can be exceptional. Still, I hope a future post will discuss the invasion of privacy coming with increased drone activity and limitations that ought to be placed on how, when and where they should be used. By their very nature drones are annoying and intrusive. I believe your experience in Iceland — curiousity and acceptance — was the exception and not the rule. A drone is a flying lawnmower. If you are in somewhere that this would annoy people, don’t fly. Hi Spencer, nice idea with a drone to take outdoor landscapes and some good images. However, when shooting landscapes, instead of thinking of the land, think light first and then land. In a short trip like this, I know that you are limited by window of opportunities but still the above mantra works very well. Have you read ‘Mountain Light’ by Galen Rowell? In my opinion, it is a must read for any photograph trying to photograph landscapes. I have read Mountain Light! It is quite a good book for landscape photography — an absolute classic. In Iceland, it was cloudy for the entire second half of my trip. My drone arrived late because of an airline issue, and the best light I saw after that point was a sunrise at Stokksnes (image four). For a few images, I think overcast light works well (the final image, for example, would have lost many of the qualities I like if it were taken at sunset). For others, like the first photo, I certainly wish that I had arrived for better lighting. I absolutely love these photos. Nice work! I would love for drones to be more quiet. This is the only unattractive thing about them to me. I was in Big Bend in Texas a few months ago and the peaceful silent desert was disturbed by the most annoying sound you could hear (other than the more dangerous rattlesnake noise) was a guy flying a drone in the Santa Helena Canyon. If drones were silent, I think that far fewer people would take issue with them. I always tried to move as far from people as possible when I was in Iceland. I took about fifteen total flights, and other people could see the drone perhaps three times. Thank you for your perspective; it is always worthwhile to keep in mind that the landscape belongs to everyone. That last photo is indeed quite awesome. I wonder though, it really feels like it’s a “hit & miss” kind of experience, how much control did you usually have in regards to “creating an image” ? I suppose it depends a lot on what the weather allows, but getting neatly composed shots of scenes that you can just guess from the ground, with the help of a small drone with little autonomy, looks like a rather chaotic process to me. It absolutely is a chaotic process! I was usually more worried about the drone flipping than taking photos. However, I still had the ability to frame images roughly how I wanted. I had an hdmi transmitter attached to the camera, and a receiver+monitor on the ground. I was able to see everything fron the camera’s perspective, and compose to some degree by moving the drone and rotating it in the direction I want. Certainly not perfect, but I would not have been able to compose some photos (like the bridge image) any other way. Nice piece. The image of Stokksnes is spectacular! Beautiful images, especially the last one. The story is very recognizable. I visited Iceland in June and made that same last-minute decision to bring a drone. Totally changed the trip. Nice footage, especially those crazy glacier shots! Thanks for sharing. That documentary looks amazing. On one hand, I would love to work on a project like that — on the other hand, those guys are crazy. Love the footage, thanks for sharing! Thank you, Sharon! It turned out exactly how I had hoped. Iceland is an amazing country. How neat Spender, what a great idea and there are some lovely photos. I’m delighted that you were able to get your goal shot. Congratulations! I want to try this too. I’ve always wanted to fly, mainly to see the world as a bird and I think this will be a vastly more affordable and easier solution. So next step – D810 + 14-24, right? Hmm… how to do the zoom… Maybe a prime would make more sense. You’ll just need a helicopter to be able to carry all that, right? I’m sorry Spencer. I had to re-type as my old browser doesn’t like Captcha for some reason. Irritating. Anyway, I’m sorry for messing up your name. Yes, next step is the D810 + expensive primes! Just waiting for a surprise $15,000 check in the mail. Should be coming any day now. I’m only starting my journey into drone photography, but it’s great to have a completely new perspective at my disposal. It’s easier to find places for drone photography than for sweeping landscapes, too. And the Coolpix A certainly is no slouch, either. It’s not at the same level as my D800e, but it is capable of truly great 16×24 prints. Brilliant work Spencer! Your ingenuity is commendable and the kind of work that leads the industry. I don’t think drones are going to be a long term industry for reasons most of which are listed above. So you have to turn your creative juices to figuring how to get those shots from a less intrusive vehicle of your own design. You already seem comfortable with challenges. Hi Spencer. I agree with the sentiments of others here about your wonderful photos and ingenuity. I think the one you set out to get in the first place is also my favourite. I have been dabbling with a phantom 3. It flies beautifully and seems very stable and reliable. However, it is let down by the camera. I would love to use a large sensor camera without spending a large amount – like you were able to do. I am therefore very interested in your upcoming articles to see exactly what you did. I must admit your flying incidents are a little worrying seeing as how stable the phantom is. I will assume that was the harsh conditions and not the nature of the X8+ – and not, of course, your piloting! Thank you, Greg! You are being quite generous… my piloting skills need some polishing, to say the least! Still, I was flying the drone at its absolute limits. On a non-humid day, without much wind, the X8+ flies quite well. My articles should be up within the next couple weeks — first a review of the X8+, then a drone photography tutorial, and finally an article about the specific products I used to set up my X8+ for photography. If you have any specific questions in the mean time, feel free to ask here or contact me through my website. Visualizing the shot you wanted and then going through the multitude of technical issues to capture the one image is an indication of your passion for photography and inspiration for us all. I am headed to Iceland this week for my first trip of perhaps many. And reading both of your posts about this incredible landscape reaffirmed why I chose this location. I can only hope to capture a few images that take your breath away like all of those that you have posted. A drone is NOT in my camera bag, however. So I will have to double down my efforts to work from ol’ terra firma. Just curious. When I sometimes switch from stills to video, I find the creative process doesn’t flow well and images from one or the other format are less than I wanted. Did you find the logistics of drone management interfered with your creative visualization and execution of the stills? Thanks again for your posts and looking forward to reading more about your fabulous trip. Thank you for your kind comments! You will certainly love Iceland — without a doubt, it is the most beautiful place I have ever been. Be sure to budget time to explore off the beaten path! I didn’t come close to scratching the surface of what Iceland offers. That is such a wonderful question. On one hand, I averaged about one drone flight per day. 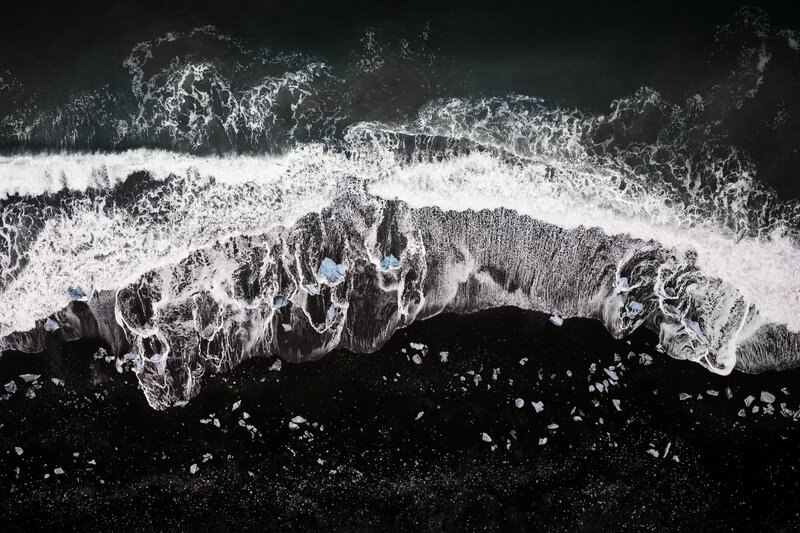 The crazy conditions made it nearly impossible to dedicate time to drone photography — I felt more like I was waiting for a break in the weather than anything. Actually, I spent much of my time without considering the possibility of flying a drone. In one instance, during the best sunset I have ever seen, it was raining with wind upwards of 30mph. Had it been calmer, I may have been divided over using the drone vs capturing the best ground-level images, but in practice I was thoroughly focussed on tripod-based photography. On the other hand, the drone certainly slowed down my progress across Iceland. To capture the shot at Jokulsarlon that I had wanted, I ended up staying near the beach for four of my fifteen days. I think the effort was worth it in the end (not solely because of this one image), but doing so meant that I didn’t see some sights that I had wanted. Also, I think that most of my drone images were weaker than they could have been. Or, I think that I could have gotten additional interesting drone photos at some locations. Perhaps this was because I was so rushed, but I also think that my ground-level photography interfered with my drone shots. The Jokulsarlon photo, for example, was about the only shot that I had pre-visualized — and even then, I had pre-visualized it weeks before rather than on location. Thank you again for your thoughtful question and comments! I hope to see some of your images when you return. Spencer, how do you transport your photography equipment and drone on planes? I expect its all hand carry but it would bust the cabin approved size/weight! Unless you are traveling first class? I am figuring how to combine drone photography with my usual travel pictures, but I am stumped just how to get it all onboard. 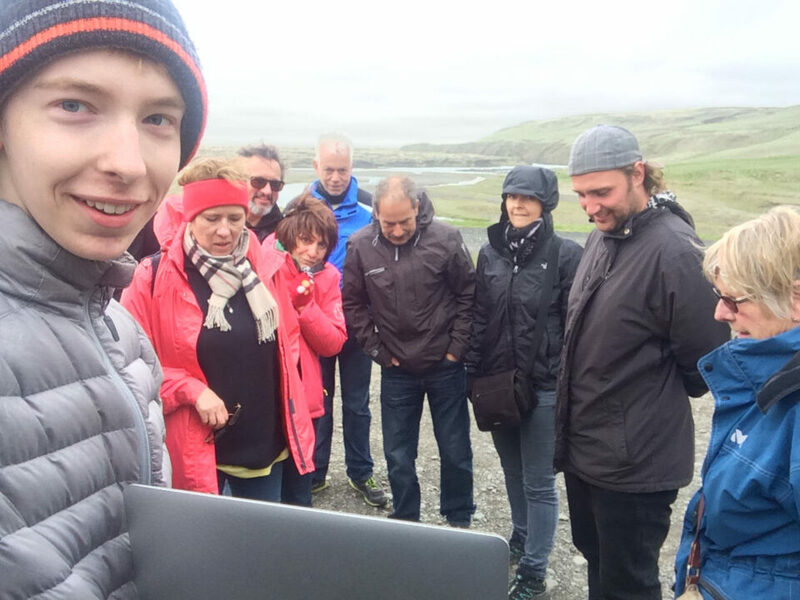 When I went to Iceland, I actually checked the drone in a storm case (a hard case with foam on the inside). It qualified as oversized luggage, so I had to pay a bag fee. However, when folded, the drone actually fits in regular checked luggage as well. From now on, I will disassemble the drone, cover it in bubble wrap, and then put it in the sturdiest suitcase I can find. Bags get beaten up in the airport, of course, so it certainly isn’t easy. With the X8+, you can remove the propellers and fold up the legs, which actually makes the drone fairly small. Only about an inch too long to fit in a carry-on bag. it is a good surprise to find you posting on this site. I am lurking around here and it is one of my favorite photography sites right now. I am one of your backers on the Atlantic Light: The West Coast of Ireland project – and I am looking forward to receiving the book. 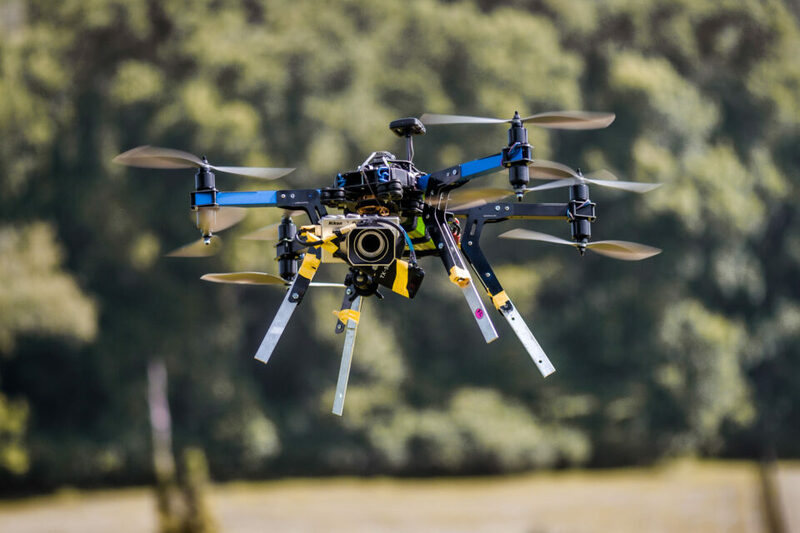 You mentioned in one of your communication that you lost a drone – can you share more of what happened? I remember you mentioning that you had a drone with 8 propellers – and I remember looking at it on the web and finding it reasonably priced for a “professional” drone. In the article above you mention that you built your own drone – any special reason for the change of heart? I am a big fan of your work and most of your pictures I find remarkable. However, I think that the drone photography is still not mature enough as a technology and that it is suited only for the technically inclined – too much maintenance and fiddling around with the devices to keep them flight worthy. Photographers have plenty to worry about with restrictions in public places thanks to terrorist acts and the image of the creepy stalker with the big telephotolens. Now comes along the drones as aerial peeping toms. Frankly wonder if this more about boys playing with toys than any real benefit to advancement of photography – in fact it will no doubt lead to more public annoyance towards the “photographers” who fly these things around and their common use to invade people’s privacy. What next – why not strap your Nikon 810 to a remote control car and send up a mountain to take photos while you sit in your car nice and warm. This mechanisation intrusion into the photographic process leads me to discount the validity of the creativity involved if the photographer isn’t even there to hold the camera. Thank you for sharing your perspective. On one hand, I agree that some people will take issue with drone photography, and they will carry that stigma over to ground-level photography as well. I wish that this weren’t the case, but some people will be inconsiderate and annoying with their drones, which hurts the rest of us. However, I disagree with your idea that drone photography may not be as creative as standard photography. Some shots are completely impossible from the ground, and it takes pre-visualization to execute such a photo from above. My Jokulsarlon image is one of my favorite photos that I took in Iceland. I’m not flying blind, either — I see exactly how the composition looks via a monitor on the ground. Perhaps these are extreme examples, but I think that there is no reason to discount this type of photography simply because it is more complex and less precise. Sometimes, it’s the only way to execute a photographer’s creative vision — which I think is directly related to advancing photography as a whole. Great article. Glad to see you’re doing some hands-on design engineering to go along with all the theory you’re getting at Northwestern. Keep up the great work and articles, Spencer.